Chinese President Hu Jintao and Japanese Prime Minister Yauo Fukuda met recently and signed some modest cooperation agreements. That doesn't sound much to get excited about, until you consider how well the Chinese and Japanese economies fit together. Think of it this way: With China's boundless supply of low-cost labor and Japan's superb education system - and an ability to work together that's clearly founded on considerable commonality of thinking - these two countries, as a pair, will be world-beaters. In fact, they'll be world leaders. The summit - while modest - marked an important policy change from the mutual hostility during the premiership of Junichiro Koizumi , whose tilt to the United States and suspicion of Chinese motivations was symptomized by his love of Elvis Presley and visits to the Yasukuni Shrine , controversial because it includes convicted World War II criminals. Nevertheless, while Japan and China have many historical reasons to hate one another, so did France and Germany after World War II, and those countries have now been partners for more than 50 years in the European Union . Thus, a close economic partnership between Japan and China is by no means unthinkable. Economically, China and Japan have much to offer each other. Both have shortages of raw materials and strong manufacturing sectors. However, the relative shortage of labor in Japan's aging society, its superb education system and the surplus of labor in China all combine to make them natural partners. 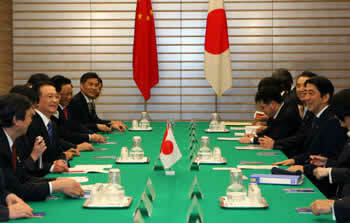 Already, Japan is China's second-largest trading partner, taking 10% of its exports and supplying 15% of its imports. Conversely, China in 2007 surpassed the United States as Japan's largest trading partner, taking 14% of its exports and supplying 21% of its imports. Between them, China and Japan have a population of 1.4 billion people, more than twice that of the European Union or the North American Free Trade Association . Their combined gross domestic product (GDP) of $8.4 trillion at market exchange rates in 2007 was about half that of the EU or NAFTA , but was combined with growth of 7% in 2007, a current account surplus of $560 billion (compared with deficits in the EU and the United States) and foreign exchange reserves of $2.4 trillion. Thus, even a loose bilateral trade association between China and Japan would be a powerful economic force . Free trade and free movement of labor between the two countries would enable them to deepen their economic relationship still further, making the Japan-China trade axis the most important in the world - even more so than any bilateral U.S. relationship. Longer-term, an EU-style economic union - perhaps including such neighbors as Korea, Taiwan and Vietnam - could become the world's leading economic power, surpassing even the United States and the EU itself. As a U.S. geo-strategist, one worries somewhat about this. The United States has traditionally been able to count on Japan as a counterweight, both economically, and to a limited extent, militarily against a resurgent and aggressive China. That no longer seems to be so certain; an immensely powerful alliance between Japan and China might develop into the United States' military equal, and would certainly be animated by a world view very different from that of the United States or, indeed, the EU countries. As an investor, one rejoices in it and seeks to find sources of future profit from the two countries' deepening relationship. One such source of profits are major Japanese companies such as Toshiba Corp. (PINK: TOSBF ). This major manufacturer of computers, medical electronic equipment and telecommunications systems has developed a highly integrated manufacturing capability in China, enabling it to synergize its technical innovation with China's highly skilled, low-cost workforce. Toshiba's shares are trading at about 22 times earnings, reasonable for a high-tech company. Another might be a Chinese automotive manufacturer such as Brilliance China Automotive Holdings (ADR: BCAHY ), already a strong automobile and bus manufacturer in the Chinese domestic market, which has a joint venture with Bayerische Motoren Werke AG , better-known as BMW, and potentially can benefit from its lower labor costs to attack the Japanese market. As relations between China and Japan improve, and tariff and non-tariff barriers in Japan are reduced, companies such as Brilliance may be major beneficiaries. Brilliance China trades at a pricey 48 times earnings, as it has only recently returned to profitability in the highly competitive Chinese automotive market , but its long term prospects appear excellent. There are two categories of beneficiaries from a trading relationship between China and Japan that's closer and more-barrier free. The first group consists chiefly of Japanese high-tech companies that are able to take advantage of China's lower labor costs and more-profitably attack the world markets. The second group consists of low-cost, China-based manufacturing companies that can sell to Japan as a particularly juicy nearby market with similar cultural and taste characteristics - unlike the unfamiliar west. Both types of companies are likely to be big long-term winners from this trend. Money Morning Investment Travelogue : The View From China: Despite the Auto Industry's Pedal-to-the-Metal Growth, a Safety Play May Offer the Safest Play . Money Morning Investment Travelogue : The View From China: The Single Secret That Will Put You on the Pathway to Profits . Wikipedia : Junichiro Koizumi . Wikipedia : China President Hu Jintao . San Francisco Chronicle : Japanese Prime Minister Yauo Fukuda . Auto Industry UK: Brilliance China returned to black in 2007.